The elevators here are kind of awesome. It was one of the first things we noticed after arriving at our hotel and taking our suitcases upstairs. Most of the elevators have manual doors and are incredibly small. The apartment elevators all hold about three people squished very closely together. If you forgot to close the elevator door then it won’t go anywhere so our directors taught us about “elevator culture” which apparently we don’t have. Essentially it’s just that when you get out of an elevator, you make sure you close both doors. The second night there my friend and I managed to get locked on the eighth floor for about ten minutes because someone had left the elevator door open downstairs. I live with a host family on an apartment on Santa Fe avenue, one of the main streets in my neighborhood. The way the city is divided there are large, main avenues (such as Santa Fe) every four blocks which run roughly east to west. My host family consists of a mother and her three kids who are all around my age. The apartment is at the top of a pretty old building so I’m living in the tiny room that would have been the servants quarters in the sixties. I also have my own bathroom which is almost as big as my room because it has the laundry room in it as well. Luckily the laundry part of the bathroom only consists of one washing machine, since Argentines all hang dry their clothing, so it doesn’t take up much room. In addition to people, there’s also a miniature poodle who I’ve been working to win over. His name is Kino and so far I’ve been doing pretty well, if Luz (my host mom) is hanging out in the kitchen he’ll come hang out with me and occasionally, when no one’s home, we’ll take naps on my bed together. The Belgrano University is a very impressive 17 or so story building with elevators that take you to a quarter of the floors and stairs to get you the rest of the way. The international student offices are on the seventeenth floor which hosts an excellent view of the city. Our program director brought us to the university during the public transportation orientation to ensure that we would all know where it was. It’s conveniently located twenty minutes from my apartment by bus or subway, both of which I have now mastered. Sort of. 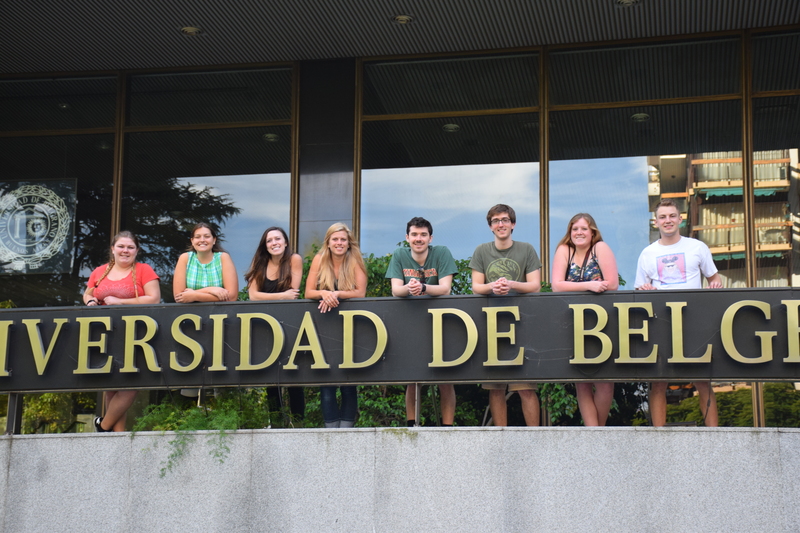 Pictured below are the eight regular start students, we all arrived together at the airport and we’ve been doing orientation activities all week together. The early start students all arrived at the end of January and most of them are on vacation in other parts of the country this week so we’ve only met a couple of them. At the actual university orientation for international students they told us a lot of information in Spanish, most of it was stuff that the API folks had already told us about classes and attendance policies, things to do around Buenos Aires etc. I spent most of it looking through the roster to see what other countries kids were from: lots and lots of Europeans. 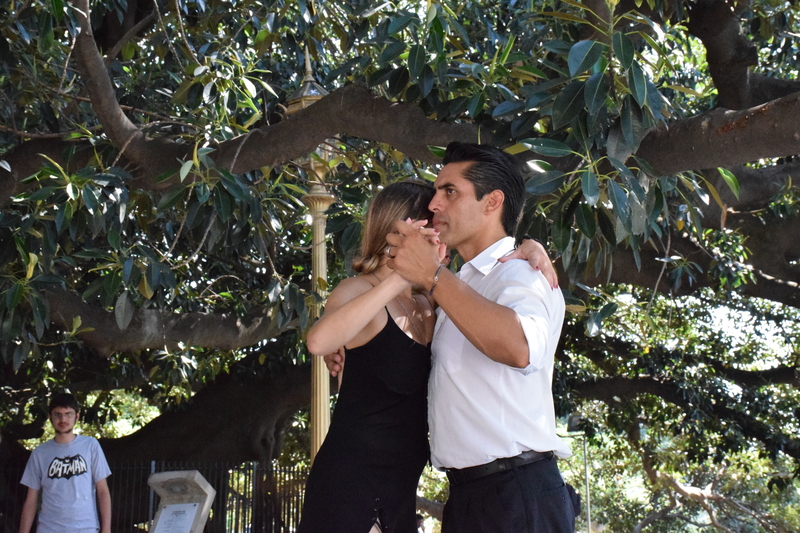 The best part of the orientation was a tango demonstration by the teacher who will be teaching the tango class. Unfortunately my camera wasn’t behaving so the picture isn’t very good. 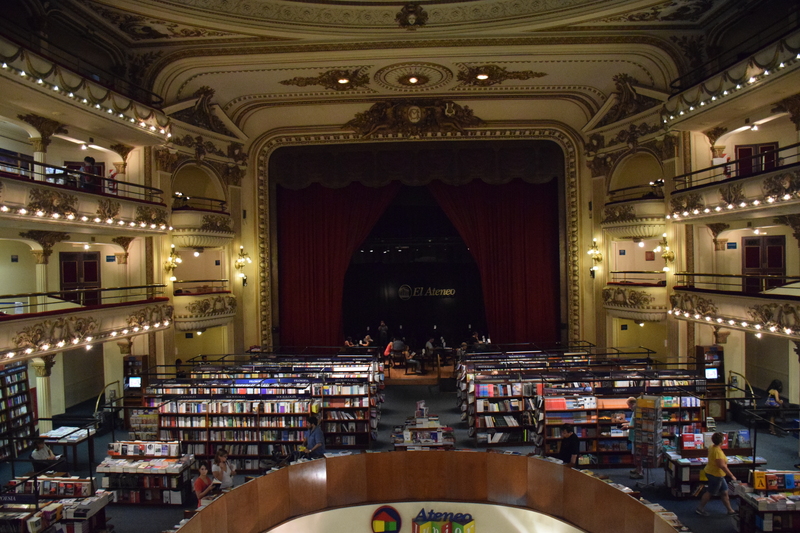 One of the sites to see in Buenos Aires is El Ateneo, a giant bookstore in an old theater. I stumbled across it a few weeks ago on a list of the top ten libraries to visit in the world. 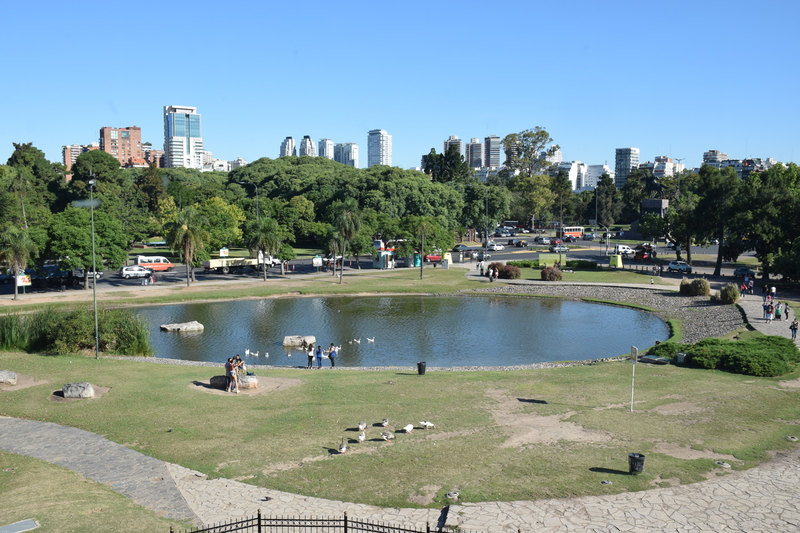 Since it was in Buenos Aires I figured I’d google the location and it turns out it’s just down the street from me! So I left early one morning and wandered around this giant bookstore. The little balcony seats on the edges next to the stage are all reading rooms and the stage itself is a cute little coffee shop. There’s also a nice art show on the second floor. 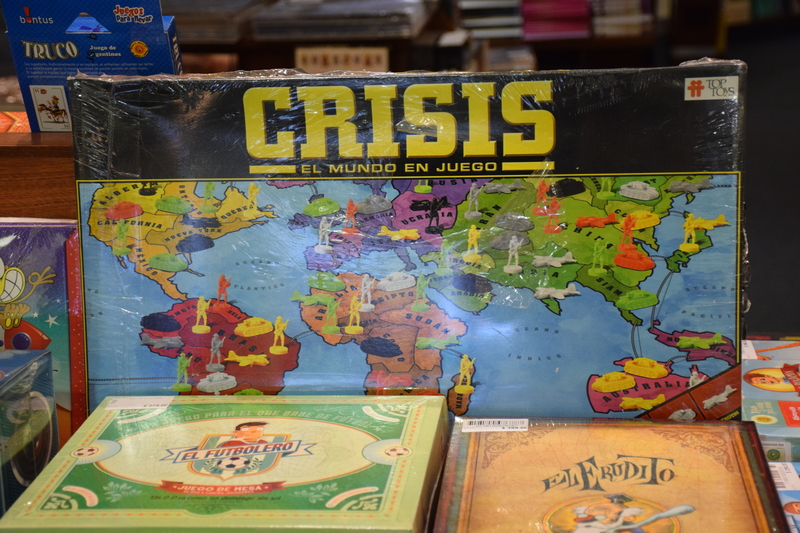 There was also a stand with some games, this one was oddly familiar…. 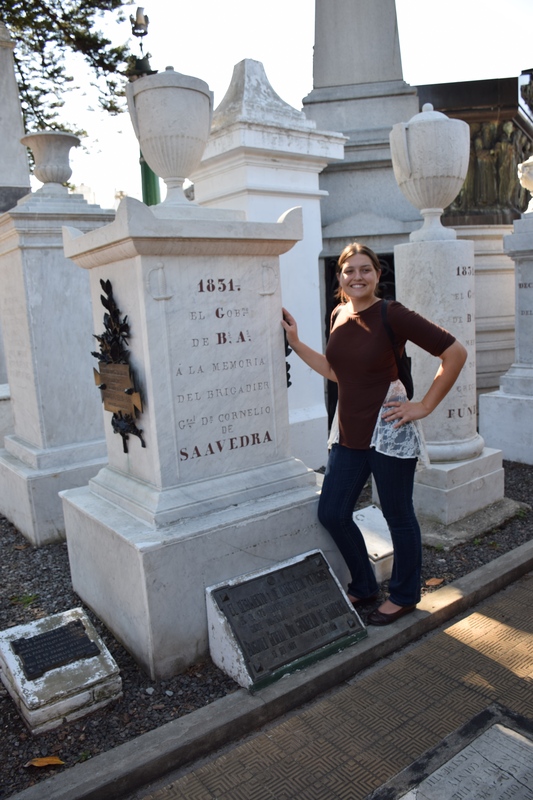 Gaby is our cultural director and takes us on excursions throughout the city. She’s also a tour guide so she knows literally everything about everything that she takes us to see. It’s really really fun, she knows all of the greatest stories. 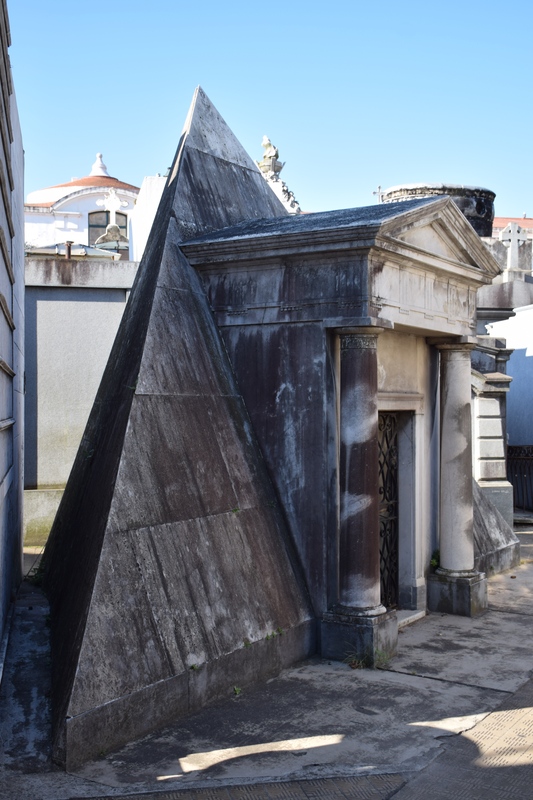 So she took us on a tour of the Recoleta Cemetery and told us stories about some of its inhabitants. Before we even entered the cemetery we ran into some street performers who were dancing the tango under a giant tree. Each plot is owned by families who create their own homage to their ancestors. Gaby didn’t know the story behind this one, partly because it didn’t have a name on it, but it looked really, really cool and kind of shows off how unique some of the plots are. 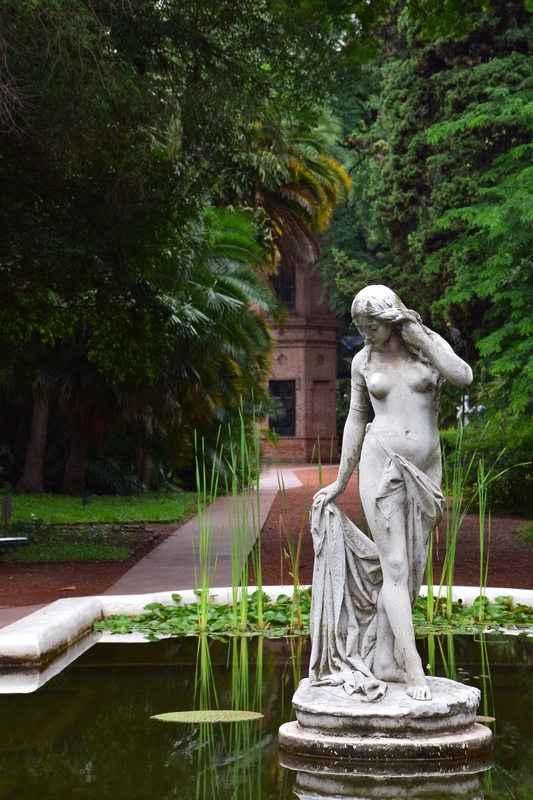 The botanical garden is also just up the street from me (although in the other direction) and, lately, we’ve been using it as a meeting place for the students who live in the Recoleta neighborhood (I live in Palermo, they’re right next to each other but far enough apart that it’s easier to bus between them). I beat the other students there (since I live so close) so I took a stroll around the park and admired the many statues and plants there. 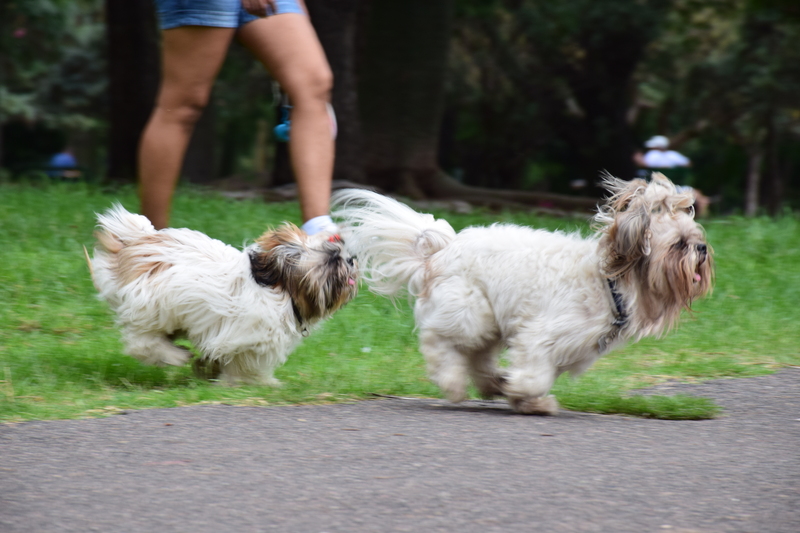 There are a lot of dogs in Buenos Aires. 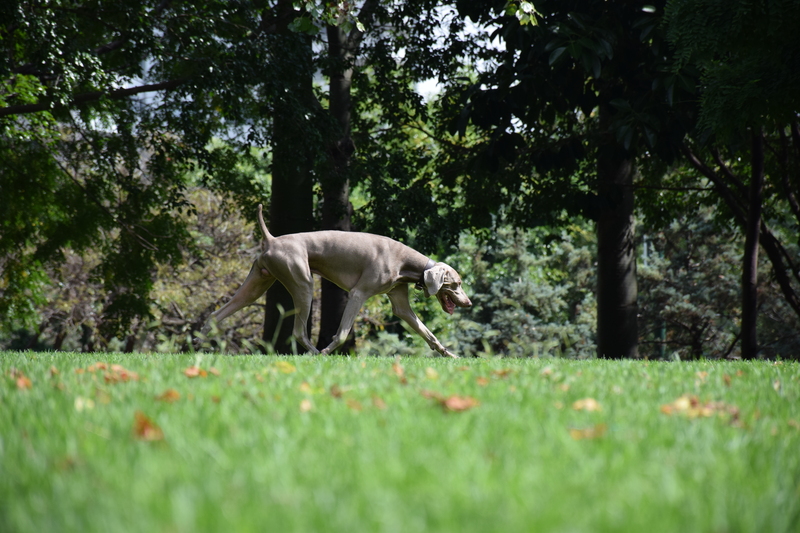 Like a lot, including my own perrito named Kino. After meeting in the gardens one day we headed over to a different park nearby to grab pizza for lunch and chill in the park. We even tossed a frisbee around! The only ones having more fun than us (and the girls who were watching us play frisbee, I got the feeling Argentines don’t often play frisbee…), were the dogs running around having the times of their lives. 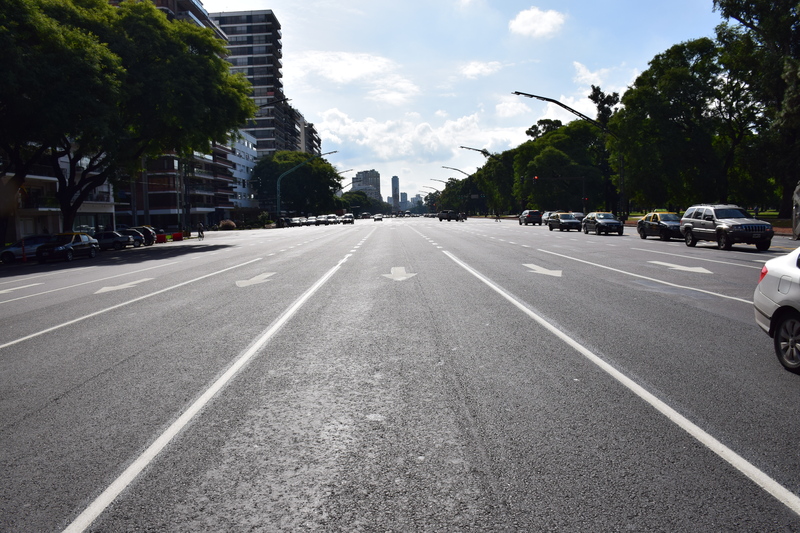 Buenos Aires is not the most eco-friendly city, but so far it’s definitely the greenest city I’ve ever been to. 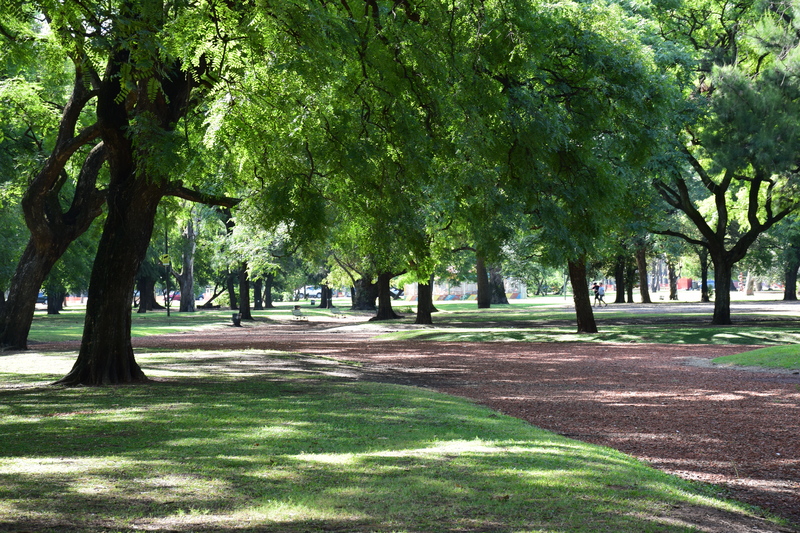 Trees line almost every street and there are hundreds of parks to hang out in. It’s a beautiful city and I absolutely love walking around. This little temple was in one of the many parks we were hanging out in during some down time before our cooking class. It looks pretty similar to the WWI memorial in Washington D.C. (which is my favorite except for FDR) so I was really excited to find another cool little hang out place. Especially because this one doesn’t freeze for three months out of the year making it a horrible study area. There’s a ton of graffiti all over the city, but whereas in the US if I squint and turn my head far enough I might be able to read it, most of the time it’s not at all legible here. Nonetheless the street art is quite beautiful and occasionally amusing. Like when I wear the same color shirt as the woman wanting me to follow her on twitter. That little piece of graffiti was across the way from the home where we had our cooking class. 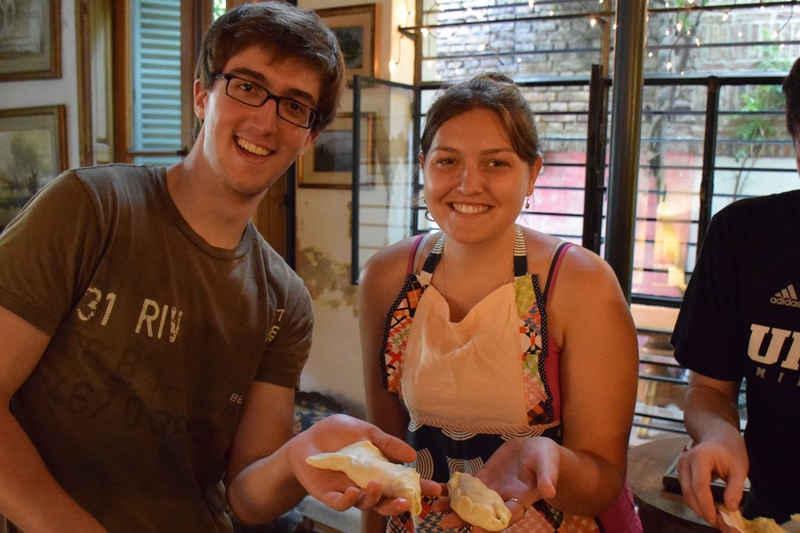 A professional chef taught us how to make empanadas (a crispy cooked entre with meat or cheese or something good on the inside and dough on the outside) and alfajores (heaven on earth). It’s impossible to tell what’s on the inside of an empanada unless you know the secret. The chef gave us a guide and told us it might change for some empanadas but carne empanadas (truly the best ones) would all look the same. We all then tried to make perfect carne empanadas and managed it eventually…They all tasted good when they came out of the oven no matter how pretty they were! The planetarium near my house is a pretty cool little place. 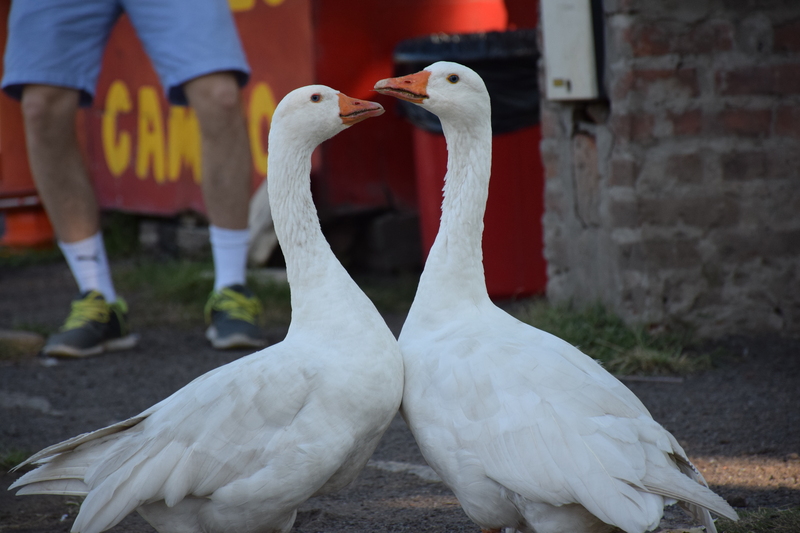 In addition to a large pond with lots of ducks, there are many uncooperative geese as well. Look how close I got! Literally they just had to duck their heads down a little bit.. The planetarium itself has a few small science exhibits and a wrap around imax type show on the top floor. It was a beautiful show with gorgeous pictures and, despite it being all in Spanish, I learned a bit too. He showed us the location of a few constellations, most I didn’t know; as well as other cool locations of planets and how the astrological signs got their dates. This is a view from the planetarium itself overlooking the city. 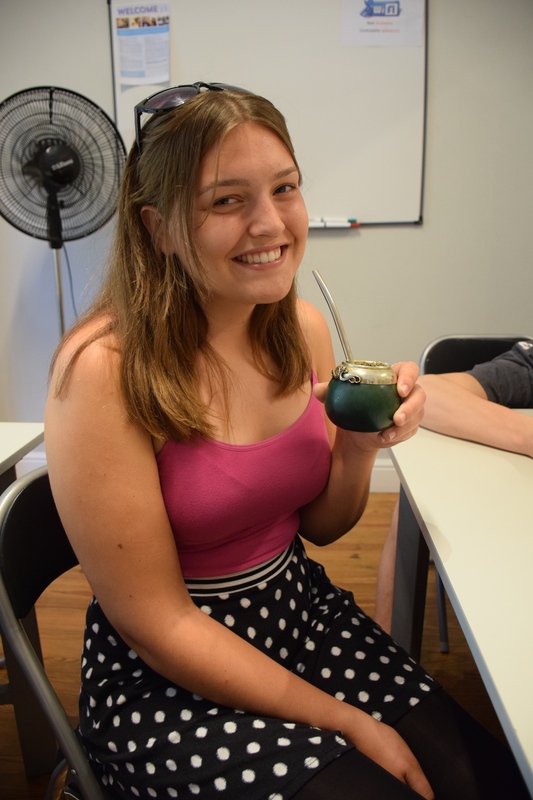 The official drink of Argentina is Mate, a type of rather bitter tea that’s drunk out of a gourd and shared with friends. It’s a really cool part of the culture and much to everyone’s surprise I actually liked the mate. Especially after I added sugar to it. To make mate you fill the mate (which is the name of the gourd) with yerba mate and then add a spoonful of sugar (because it makes the mate go down…the mate go down…) and pour in some hot water. You can also make cold mate in the summer and add ice cubes and pour in juice! Normally the mate would be served by a designated server to the others, each person would drink the whole cup of mate and then the server would add more water and pass the cup along. As with the color of a rose, the way the mate is prepared can mean a lot of different things; and, as with roses, this is largely ignored. #datcitylyfe: Fun fact about folks in the US: we eat with one handing on the table with our utensil, the other in our lap. Don’t believe me? Go out to dinner with someone and watch how they eat — and don’t let them order something that requires a knife and fork to eat because then this obviously doesn’t apply. 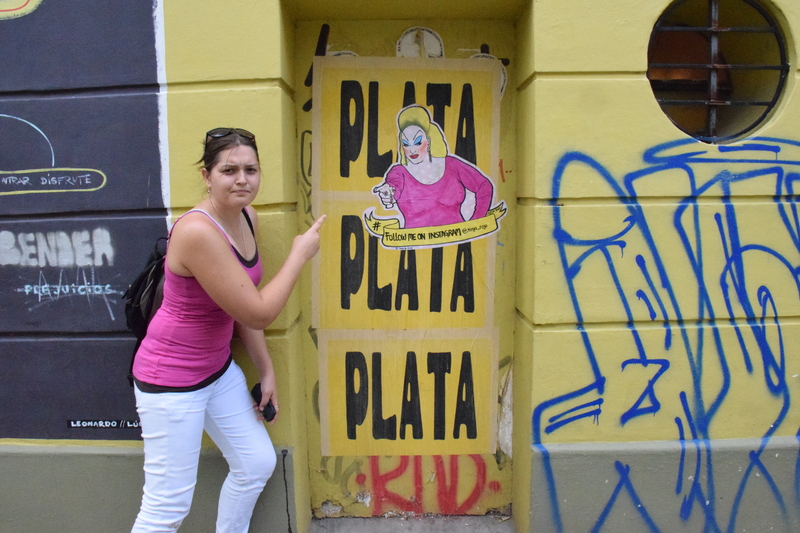 Well, during our cultural orientation Jimena told all of us this and we didn’t really believe her. We told her that we all thought it was rude to eat with our elbow on the table, but only if it was at a somewhat formal place, but why would we eat with one hand in our lap? She laughed and then told us that Argentinians eat with both hands on the table. We then went out to lunch, forgetting what she’d told us and happily began eating our Italian food and empanadas. Halfway through I noticed that all of us were eating our food with one hand and the other was resting in our laps. I pointed this out and all of us laughed and later told Jimena that she had been correct. Later that night at dinner, now hyper-aware of how I eat, I watched the Argentinians eat with one hand holding a utensil and the other resting on the table at the wrist or elbow. I then tried to mimic them and spent the entire meal reminding myself to keep both hands on the table. Other fun cultural differences: platform shoes are majorly in style here. When I walk down the street most of the girls are wearing platforms and I’m still taller than most of them. I don’t often see any elaborate hairstyles, not even straightened hair. This is most likely due to the fact that it’s super humid here so any type of hairdo won’t last very long. When greeting each other, the Argentines kiss each other on the right cheek. I think this is awesome, others have had a little more trouble adjusting to kissing everyone. The other biggest difference is the schedule difference, it’s not unusual here to stay out until 4 am, have a small breakfast at 10 or 11am, lunch at 1, tea time (or first dinner as we’ve taken to calling it) around 5, and dinner at 10pm. And that has been a rather difficult schedule to get used to, especially when I miss first dinner.